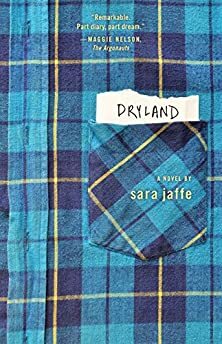 Largehearted Boy: Book Notes - Sara Jaffe "Dryland"
Book Notes - Sara Jaffe "Dryland"
Sara Jaffe's Dryland is a poignant coming of age novel set in the Portland of the early '90s, a fascinating debut. "Jaffe's exceptional debut, a heartfelt coming-of-age story set in Portland, Ore., in 1992, exquisitely captures the nostalgia and heartbreak of youth." Music is and has been an important part of my life, but it wasn't immediately easy for me to come up with a playlist for Dryland. One reason for that, I think, is that my 15-year-old main character, Julie, is just on the cusp of having music become super important to her, but it hasn't happened yet. So the music I listened to while writing the book could inflect the style and the tone of the book, but I needed to keep it out of earshot from Julie. It was interesting, though, to go back to what I was listening to and think about how it might have found its way in. Here's a list of songs that hovered around the creation of Dryland, some directly, some more oblique. Arthur Russell, "Let's Go Swimming": About halfway through the writing of the book, I hosted a pool party/reading (there's lots of swimming in the book), and I came up with an all swimming/pools playlist. Lots of the songs are very upbeat ("Do the Swim," etc.) but the one's that most match the book are more melancholy, meditative, ambivalent about whether or not to jump on in. Arthur Russell's "Let's Go Swimming," is all whisper and space, a wistful, loose song more about a remembered desire to swim than the moment of swimming itself. Loudon Wainwright, "The Swimming Song": Super catchy and seemingly upbeat, but upfront about the relationship between swimming and mortality: "This summer I went swimming/ this summer I might have drowned." The possibility of sinking is there in every stroke. Frank Ocean, "Swim Good": So emo!! So dramatic!! The speaker in the song wants to "swim good," and believes that doing so will allow him to escape whatever he's trying to flee from, but it's not going to happen, no way. Sometimes failure at swimming isn't sinking, or drowning, but simply being dragged back to the shore. Sonic Youth, "100%": This song appears near the very end of Dryland—Ben plays it for Julie after asking her if she prefers to listen to sad music or angry music when she's depressed. She's drawn to the loud guitars and discord in a way she hasn't been before, and she lets herself recognize those sounds as analogous to what's going on inside her head. I see this as her "gateway song" into more loud music (it was mine). It's also a great example of what I call an "all hook no chorus" structure—it's catchy, and the melody line is repetitive, but there's no lyric refrain. It builds subtly and arrives only at its completion. Kurt Vile, "Peeping Tomboy": Shambly and repetitive, a song that starts with refusals ("I don't wanna change, but I don't wanna stay the same") and moves suddenly into unselfconsciously earnest affirmation of a crush on the titular "tomboy." Julie moves similarly between refusal and crushed-out self-indulgence. In the song, Vile's affirmations form a chorus of sorts, but the two refrains are oddly placed, there more for emotional resonance than structural cohesion. Yellow Fever, "Culver City": As if someone boiled a pop song down to its bones and put it back together with nothing but string. I don't know here what's hook and what's chorus, but each section of the song is distinct, surprising, and almost unconscionably catchy. There's something about songs like these—songs that indulge in the pleasures of pop songs without following an overly determined structure—that also gets at how I think about plot. I'm invested in narrative, and in things "happening" in my fiction, but I do my best to avoid expected highs and lows, laborious attention to well-connected causes and effects. My hope is that my readers can stay close to the grain of language and experience and fill in those causal relationships, determine the shape of the story, themselves. Aislers Set, "I've Been Mistreated": One of my favorite crush songs. The lyrical content makes it seem as if the tone should be despairing—"I don't want to be the girl that's driving you home/ just to see you in and turn and go back alone"—but the pop-gem-ness of the melodies and the somehow bold waver in vocalist Linton's voice make it clear that the "mistreatment" is itself part of the thrill of the crush. I could see Julie five years from the end of the book choosing this song to characterize her crush on Alexis. Liz Phair, "Don't Have Time": I've been asked whether Dryland is a coming-out story. I'm undecided. But if its version of coming-out had an anthem, I'd choose this song—it's the song that accompanied the girl-on-girl kiss in the 1995 John Singleton movie Higher Learning (if memory serves—it's impossible to find any online video documentation of the scene). The song is gay only because of that association, but the pure ambivalence encapsulates my then-thinking about my sexuality. Phair, singing, as usual, in a key too low for her voice, is cynical, and self-consciously so: "If I could solve your problems/ what do you think I would be/ one stupid seagull picking Styrofoam up out of the sea." The guitars shimmer in the refrain but her voice is pissed-off, boredly, "Don't have time" for your (or her own?) problems. The song ends with nearly a minute of layered sound: crooned, dreamy melody low in the mix, guitar chord continually resolving and unresolving itself, shards of distortion that begin as an accent but sharpen, come forward. There's a vision of something easier and an impatient itching to get there. By the end of the song the static has shaped itself into the cry of seagulls, taunting the people stuck on the ground who are taunting themselves for needing them. Rich Homie Quan, "Type of Way": I love the vague precision of the title phrase, the idea that a nondescriptive phrase, if repeated and contextualized enough, can begin to crystallize and take on meaning. It's simultaneously wholly inarticulate and completely expressive. Exciting for me at the level of language, and also a pretty sweet analogue to the way Julie expresses herself. Dog Faced Hermans, "How We Connect": My favorite song from one of my favorite bands. Amidst the tricky-steady drums, the jagged, insistent guitar, and the dizzingly triumphant trumpet, Marion Coutts sings about the impossible possibility of two bodies ever connecting. "Poverty lies in the space between us/ mystery lies in the space between us." Because Julie has little frame of reference to understand her physical encounters in the book, she experiences both the poverty and mystery viscerally, with little mediation. John Cale, "Paris 1919": Honestly, I'm at a loss to describe how this song is reflected in the novel, but it's probably the song I listened to most during its writing, so it must be in there somewhere. One of my most productive stints writing the book was when I had a residency at Virginia Center for the Creative Arts, and I was lucky enough to wind up in a composer's studio, with a white grand piano in the middle of the room. I'd play whenever I was stuck writing, and I ended up downloading the sheet music to this one. Like so many songs I'm drawn to, the poppy structure belies some darkness to the lyrics: "You're a ghost, la la la la la la la la la." R.E.M., "Country Feedback": This is the most prominent song in the book, the most important to Julie. Out of Time was R.E.M. 's breakthrough album, but committed listeners fast-forwarded past "Losing My Religion" to land on "Country Feedback." The song's buried under the weight of its own scrawl and the impermeability of its lyrics; finding it always feels like a discovery. Julie leafs through R.E.M. features looking for a mention of the song, which of course she never finds. She's convinced it only exists on her copy of the cassette. When Michael Stipe repeats "It's crazy what you could've had" his voice is all longing, and because the listener has no clue what, specifically, he's singing about, she gets to stand beside him and feel her own longing, rather than spill over into easy identification. Absolutely a gateway song for an indie-rock-kid in the making.